Our Biodegradable Urns dissolve naturally without harming the environment. Pet urns offer a personal connection with your pet even after passing. Only an animal lover can understand the sadness of losing a pet. We view our pets as part of the family, with personalities and charms as distinct as any playful child or eccentric aunt. Create Lasting Memories for those who served our country with a beautiful American Made Flag Case. Browse our selection of whimsical Garden Urns. The natural warmth and beauty of wood is reflected in hardwood urns. The distinct patterns that different species of hardwood urns hold combined with the hand-rubbed stains and finishes, ensure that every hardwood urn is as individual as the life it celebrates. Individual keepsake jewelry can play an important part in the grief process allowing family members to create a personal tribute that will last a lifetime. Our miniature urns are hand-crafted from solid brass, bronze, and copper. 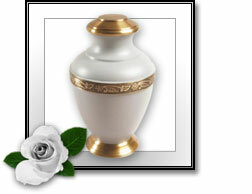 Click here to browse our selection or Miniature Urns. Browse our selection of Natural Urns.